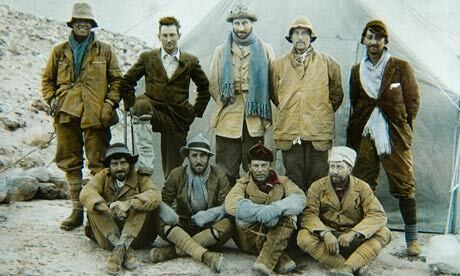 'Into the Silence: The Great War, Mallory and the Conquest of Everest' by Wade Davis is a big book in many dimensions. Physically the hardback is heavy, unwieldy reading as I stood on the train into London yesterday. It is long - I am in the early 200s and we are only embarking on Mallory's first (of three) expeditions to Everest; and, of theme. It is not simply a book about a failure to conquer the highest of peaks, but of why such an attempt was so important, at that time, when the flower of British youth had been decimated by the Great War, lost to the mud of Flanders, and society yearned for triumph without that appalling adversity. Conquering Everest was to help re-establish an Empire at ease with itself as it reached, as it happened, its greatest geographical extent. Having helped found two banks (small but perfectly formed and directly aimed at securing financial inclusion for the 'unbankable'), one of the most puzzling aspects of our financial crisis is the assumption that it is debtors who are to blame. This is most notable in Europe. One of the reasons why Germany is so keen on austerity for the Mediterranean South is that German banks themselves are heavily exposed to Southern lending. Default would ripple through the system upending apparent 'Northern' probity. It is puzzling because it seems obvious to me that the decision to lend is that of the bank and, therefore, they co-own the responsibility, indeed the responsibility is more gravely their's than the borrowers. A day spent at the Wittenham Clumps (and Dorchester on Thames). The Clumps stand on a hill above the Thames valley from which the views emanate as gentling spectacle shot through with modernity. To one side is the very visible Didcot Power Station, though soon to be decommissioned and eventually dismantled, to another, distant power project which is JET - the Joint European Taurus - an experimental nuclear fusion reactor wanting to take off where Didcot's coal steps down. I thought the transiency of both would not outlive the trees, these trees or their successor trees. The natural world is transient but our makings more so. But even the lumbering Didcot fails to dominate a vision of distant hills, a closer, meandering river and the scattered villages of Oxfordshire, most prominent of which is Dorchester itself. Kathleen Norris has developed a excellent reputation as a writer of books that are part autobiography, part spiritual reflection, part cultural critique. Her 'Acedia & Me: A Marriage, Monks and a Writer's Life' is no exception. In a discursive, circumambulatory way, she explores the Desert monks notion of 'acedia', its cultural history and modern relevance. 'Acedia' is not an easy concept to grasp. It was the foundational 'evil thought' in the fourth century monk and theologian, Evagrius', list of eight such patterns of thinking that together combine to lead us astray. In the medieval world, they become hardened, and reified, as the 'seven deadly sins' from the list of which 'acedia' has fallen by the way side, co-opted and supplanted by 'pride'. Today, with a friend, I went to the Pallant Gallery in Chichester, which is a jewel of a place, to see three exhibitions (and eat an excellent lunch, thank you Nick). 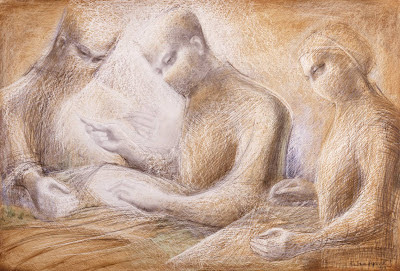 The one that made the deepest impression, quietly amplifying in attention and memory, were the hospital drawings of Barbara Hepworth. These she worked on in 1948. They are pictures of surgeons and nurses preparing or conducting operations. She, and her husband, Ben Nicholson, had recently had the experience of a major health crisis with their daughter that was both stressful in itself and had come near to beggaring them in the pre-National Health Service world. 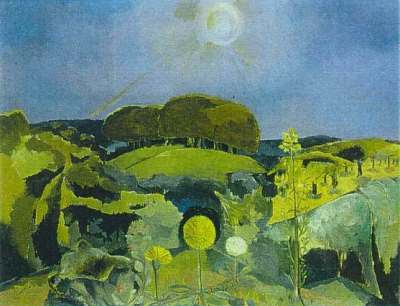 These pictures were created, in part, out of Hepworth's gratitude for medical skill and for the birth of a National Health Service that made such skill available to all, free at the point of delivery. If you could consciously invent an humanitarian disaster that would fail to get traction on the imagination of the general public, it would be the tragic events unfolding in Syria and its neighbours. It is not a sudden onset, natural catastrophe inflicted on people already poor who you can see as wholly blameless: an act of God (though more likely due to tectonic plates or seriously inclement weather). It is a long drawn out, man made, political crisis with no discernable end. A civil war in which all sides carry the potential for blame: an authoritarian regime meets opposition groups, some of which are steadily being radicalised in an Islamist direction (that makes us, in 'the West', nervous and disconnected). The people themselves, the innocent, displaced victims of conflict are from a middle income country. They may arrive in Lebanon or Jordan on the verge of destitution and traumatised but they do not look impoverished. The epigraph to Howards End of 'Only connect...' is a famous one but what does it mean? Having re-read E. M. Forster's 'best novel' (his own valuation), I realise that there are, at least, three. The first, and dominant one, is in the sphere of human relationships. Establishing true connection is found in living a life freed of hypocrisy. Mr Wilcox cannot have a mistress and have it forgiven by his second wife and yet retreat into conventional approbation when the forgiving wife's sister is discovered as pregnant out of wedlock. Our behaviours must strive after a coherent whole. We cannot live in compartments; however, superficially, comfortable. The illustration above is of Job and his family secure in their (self) righteous assumption that all is well. They are a pious, believing family, secure in their household and followers of the law whose open text is on Job's lap. 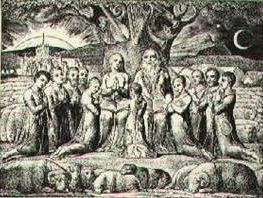 The illustration below is of Job and his family after Job's trials at the hand of Satan, his encounter face to face with God, and the restoration and renewal of his family's life. The musical instruments of Divine inspiration which in the first plate hang, unattended, on the tree have, in the last plate of Blake's magnificent series, been taken down and Job and his family play on joyfully, serenely. In this fine juxtaposition is William Blake's whole abiding message: nothing replaces a genuine opening to the experience of the 'divine within' and that experience is shaped both within a recognisable pattern and is wholly unique to every individual person. When I was nine or ten, my mother found me, sitting up in bed, one Saturday morning reading the Book of Job. I think this was spurred by sibling rivalry as my (elder) brother, at the time, was reading the whole Bible from cover to cover (though whether he finished it entire I cannot recall). I was captivated by the text, its strangeness and its poetry, but I doubt whether I understood very much and cannot now recall why it was this particular book I chose. 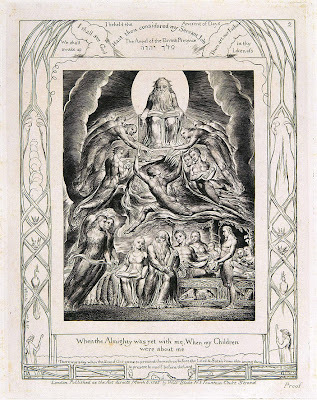 One of William Blake's last major works was his engraved illustrations to the Book of Job and Kathleen Raine in her 'The Human Face of God: William Blake and the Book of Job' gives a magisterial and compelling account of the meaning and poetry that Blake infused into these illustrations. When I was in the Pushkin gallery in Moscow recently, a gallery I know intimately, I was surprised to discover this fabulous painting of an old woman by Rembrandt was not there. If you had asked me at the time to swear on my mother's life (and she was with me) that this painting belonged in the Pushkin, I would have been tempted to such a wager! But it is not! In fact, it is in Stockholm's National Gallery where I have seen it, not multiple times (as I might in the Pushkin) but, only once, on a brief visit between meetings a year or so ago! This can be read as a testimony to the arresting nature of Rembrandt's art. The ability to create familiarity instantly. Love at first sight! It can be read as the fickleness of memory, that it plays tricks is a cliche, but cliches are only truths grown over familiar! Two films of female awakening one based on a book I recently read: 'I Capture the Castle', one based on a book I have not read: 'Brick Lane'. Both drawing on very different visions of England. In the former, history plays no apparent part - the whole world is the personal world of its narrator, Cassandra. In the latter, history unfolds as a shaping background, we see the startling, shattering events of 9/11, observing some of their consequences even as the focus remains squarely on the personal dilemmas of Nazneen in relation to her family and her place. 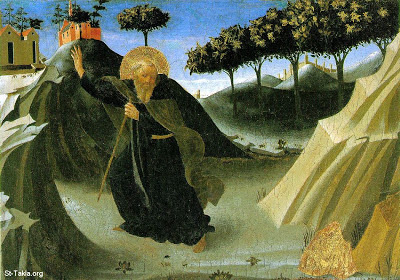 What does a fourth century monk, St Anthony the Great, have to teach us about climate change (or indeed ecological engagement in general)? Sketching (in detail) an answer to this question is at the heart of Douglas E. Christie's "The Blue Sapphire of the Mind: Notes for a Contemplative Ecology". Three things (at least) come to mind. Leaving aside the sea momentarily, Mediterraneo is both the name of one of my favourite films (by Gabriele Salvatores) about a handful of misfit Italian soldiers who 'take control' of a Greek island emptied of its active men folk during the Second World War only to find themselves enraptured by the place (and forgotten by the war) and is now an album by the incomparable L'Arpeggiata. I expect Christiana Pluhar/L'Arpeggiata are stalked by Early Music true believers with placards denouncing their audacity for running creative roughshod through 'authenticity'! However, thankfully for the majority, they pursue the joy of re-creation, of being faithful through making new; and, the music they make is movingly gorgeous!